BUYSOUNDTRAX Records presents the original soundtrack to QUANTUM QUEST: A CASSINI SPACE ODYSSEY, featuring music composed by Shawn K. Clement for the 2009 animated science fiction/adventure film from Jupiter 9 Productions and Digimax, Inc., featuring the voice talents of actors Chris Pine, Samuel L. Jackson, Hayden Christensen, Amanda Peet, Robert Picardo, Jason Alexander, Sandra Oh, Brent Spiner, James Earl Jones, William Shatner, Mark Hamill, Doug Jones, Abigail Breslin, Spencer Breslin, Gary Graham and astronaut Neil Armstrong. QUANTUM QUEST: A CASSINI SPACE ODYSSEY is set in a scientifically accurate rendering of our solar system in 3D stereoscopic. The audience is taken on a simulated solar safari, exploring the outer planets and moons of our solar system. QUANTUM QUEST: A CASSINI SPACE ODYSSEY tells the story of a photon named Dave and his heroic efforts to save his people, who are caught in a galaxy wide battle between the forces of Good and Evil. The film takes a unique and entertaining approach to science education by creating characters which embody scientific concepts and discoveries, making the movie fun as well as informative. Though other missions have been seen in film projects, QUANTUM QUEST: A CASSINI SPACE ODYSSEY is the first where NASA initiated the project with an independent filmmaker in order to create an animated fiction film to be based upon on-going missions, science, and discovery. QUANTUM QUEST: A CASSINI SPACE ODYSSEY was tied into 7 on-going space missions and includes footage from the Cassini-Huygens, SOHO, Mars Odyssey, Mars Express, Venus Express, and Mercury Messenger space missions. 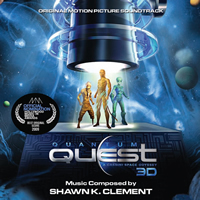 The score for QUANTUM QUEST: A CASSINI SPACE ODYSSEY was composed by Shawn K. Clement, who recorded his score with an 80 piece ensemble of the Skywalker Symphony Orchestra, at the Skywalker Scoring Stage, north of San Francisco. Co-director Dan St. Pierre describes Clement’s score as “quite unique and beautiful. It evokes feelings of wonder and transports us to strange and distant places.” Clement integrated sounds and space noises provided by NASA into the music and served as Post Audio Producer on the film. Originally from Massachusetts, Shawn K. Clement was exposed to music at a very early age in his father’s music store, where local Massachusetts rock legends like Jeff “Skunk” Baxter, guitarist for Steely Dan and The Doobie Brothers, and Joe Perry of Aerosmith, shopped and hung-out. Shawn pursued his love of music from the early age of 12 when he picked up the guitar and began his music career. Clement excelled academically and segued into composing when he studied at the prestigious Berklee College of Music in Boston. Anxious to go out and pursue his future, in 1993 Clement first visited Los Angeles and joined a country band with a regular residency at the hottest club on the Sunset Strip, Roxbury. He played sessions with a diverse roster of musicians including Skunk Baxter, Don Johnson, Eddie Van Halen, B.B. King and Harry Dean Stanton. In 1994, he decided to live in Los Angeles full time and began his work in film music. In 1996, his life was forever changed when he signed on to score the first reality television franchise, WORLD’S WILDEST POLICE VIDEOS. WORLD’S WILDEST POLICE VIDEOS continues to air in the United States and all over the world and has generated a long line of work for Clement in the genre, including series and specials such as WORLD’S SCARIEST POLICE CHASES, AVOIDING THE MOMENT OF IMPACT 2 & 3 and WHEN GOOD PETS GO BAD 1 & 2 (all for Fox Television); plus THE WORLD’S MOST AMAZING VIDEOS (NBC), THE WORLD’S MOST... series for Discovery Communications, and THE WORLD’S SCARIEST GHOSTS, hosted by James Coburn on ABC. Clement used the reality format to define a new musical genre that, for years now, has dominated primetime viewing. ASCAP presented Clement with a most impressive award – the prestigious ASCAP 2000 Film and Television Award for Most Performed Underscore, recognizing this accomplishment. Although Clement dominates this notable niche, it's simply one facet to a multi-dimensional composer. His versatility can be seen in diverse projects in film, television and video games, across all genres. While the darker, intense side of music appeals to him the most, Shawn’s extraordinary versatility takes him down every musical path imaginable. His music has been heard on television shows such as ENTERTAINMENT TONIGHT, EXTRA MAGAZINE, THE GUIDING LIGHT, ALLY MCBEAL, DONNY AND MARIE, MARRIED....WITH CHILDREN, ANOTHER WORLD, THE MAURY SHOW, WASTELAND, AS THE WORLD TURNS, CRIME & PUNISHMENT, RAY BRADBURY THEATRE, THE HEIGHTS, CALIFORNIA DREAMS and the acclaimed BUFFY THE VAMPIRE SLAYER (1997-1998), as well as two BATMAN video games, BATMAN: RISE OF SIN TZU and BATMAN: VENGEANCE. He has also scored feature films such as FINALE, THE APPARITION OF ROXANNE, THE BRIDES OF SODOM, VIRUS X, DEATH AND CREMATION, PLAY ON, BEYOND THE MAT, SINBAD: THE FIFTH VOYAGE and, most recently, SCARY OR DIE. In addition to scoring, Clement is one of the few composers who is also an accomplished songwriter. While composing for BUFFY THE VAMPIRE SLAYER, he also created songs that have reached cult status. Clement's sensibilities as a live player are but one key to his artistry. A mastery of musical gear has won Clement endorsements from Yamaha Guitars, Cakewalk Music Software, Garritan, Seymour Duncan, Dean Markley Strings, Rocktron, Lexicon, EMU, Frontier Design, Peavey and Nemesys. He has been featured in full-page ads in Mix, Keyboard, EQ and Recording magazines to promote gear for Frontier Designs.